Choose quality and comfort in your journeys, a service adapted to your personal or company’s specific transport needs. Return trip: Are you coming back to Sada? Call us and we will pick you up in the airport/station of your choice at the time of your arrival. Call to get a free quote. Use this service to book a taxi for all your transportation needs. Once we receive your request we will contact you as soon as possible in order to confirm the availability. Because of that, it is very important to provide accurate contact details. In case of doubt, special requirement or booking less than 12 hours in advance; please contact us using the contact section or by phone +34 693 599 589 (Whatsapp or Telegram also available). In accordance with the Organic Law 15/1999 we inform you that the company uses your personal information to provide the requested service or send you the required information. The data provided will be kept as long as you do not request the cessation of the activity. The data will not be transferred to third parties except in cases where there is a legal obligation. You have the right to obtain confirmation of whether we are treating your personal data at Taxi José Antonio Ferreiro Cortiñas, therefore you have the right to access your personal data, correct the inaccurate data or request its deletion when the data is no longer necessary for the purposes that was collected. Address: Avda. Párroco Villanueva, 39, 1 ° A. C.P. :15160 - Sada (A Coruña) Telephone: 693599589 Email: taxisada10@gmail.com. This website does not use its own or third party cookies. We respect your privacy. We are in service 24/7 all year in Sada and surrounding areas. Is a relative, a client or yourself coming to Sada? Book a ride with us and we will pick you up at the airport, train or bus station of your choosing. Feel free to contact us to get additional information. We only offer official fares approved by the Concello de Sada and Galician Government (Xunta de Galiza). 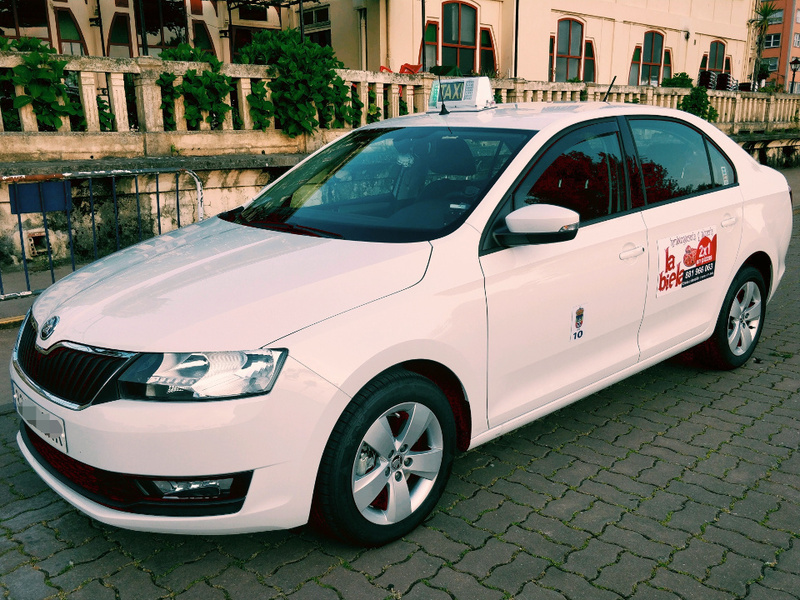 All the vehicles are equipped with an official governmental-verified taximeter. The final journey price will be the exact amount present in the taximeter plus the required extras (if any). * Includes initial distance of 1.7 km or equivalent time. ** Except wheelchairs or infant buggy. *** Except blind guide dog. Official receipt always available . Fare 1: City. Monday to Friday from 06:00 to 22:00. Saturdays from 06:00 to 15:00. Fare 3: Intercity. Monday to Saturday 06:00 to 22:00. Fare 4: Intercity. Monday to Friday from 22:00 to 06:00 (next day). Saturdays from 15:00 to 23:59. Sundays and public holidays (including 24th December and 31st December): whole day. From this section you’ll be able to contact us directly in relation to any aspect of the service, also to get a free quote. It is really easy booking a taxi using our booking service. Feel free to contact us by phone +34 693 599 589 (Whatsapp or Telegram also available) in relation to any query you might have. Su reserva ha sido solicitada. Para confirmar el servicio nos pondremos en contacto con usted por los medios que nos ha facilitado en los datos de la reserva. Recuerde que puede contactar con nosotros para cualquier aclaración sobre su reserva en el teléfono 693 599 589, donde también le atenderemos a través de WhatsApp o Telegram, o mediante nuestra sección de contacto. Lamentamos informarle de que existe un error en la solicitud de su reserva. Por favor, póngase en contacto con nosotros en el teléfono 693 599 589, donde también le atenderemos través de WhatsApp o Telegram, o mediante nuestra sección de contacto. Recuerde que puede también contactar con nosotros en el teléfono 693 599 589, donde también le atenderemos a través de WhatsApp o Telegram. Lamentamos informarle de que ha habido un error en el envío de su mensaje. Por favor, póngase en contacto con nosotros en el teléfono 693 599 589, donde también le atenderemos a través de WhatsApp o Telegram. © Taxi Sada. Design: HTML5 UP.